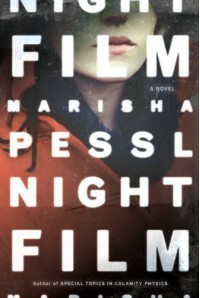 Night Film is an end-of-summer blockbuster book: jazzy writing, big budget productions, and action-oriented mystique. I picked up Night Film after hearing the author interviewed on NPR; the interview was borderline snobbish, but the book reflected none of that—it was a fun ride. For the record, I didn’t get to play with the interactive features of this book; this review is based on the stand-alone content: words and pictures. If you read this book armed with an Android or iDevice, you can play along as a detective, swiping your virtual magnifying glass along the page. From what I read, there are audio recordings, film clips, and other multimedia clues that pop out and onto your device. Beside the interspaced interactive features and pseudo newspaper articles, the author interjects other literary tricks, such as: frequent sentence italicization (about one every page) and mid-scene chapter splicing (there are 117 chapters). I’ll admit—I bought into it. I love the cerebral quaintness of an independent book. This is NOT an independent book; this is a multi-million dollar production. With that in mind, I set aside literary pickiness, grabbed the popcorn, and munched away. Yes, there are blond haired ingénues. Yes, there are dark corners of mystery (Dan Brown should be proud). Yes, there are elements that make no sense whatsoever. That said—it was a lot of fun. To continue my popcorn eating analogy, like most big budget productions, my popcorn ran out mid-show. At the beginning, the writing was buttery and the wit fresh. I devoured it all. Thankfully, the author came mid-book to refill my bucket, but the refill wasn’t as fresh or buttery—it was good, but a little stale by comparison. Then the credits rolled. And like every Marvel film, an end-credit scene was added (a few, actually). My popcorn was gone; I was licking the bottom of the bucket. My fingers were covered with sinful buttery salt—but it was satisfying nonetheless. Night Film is a fun four stars. There weren’t many places to go after my whirlwind tour of New York City voodoo shops, tattoo parlors, mental institutes, and decrepit apartment buildings. The ending(s) brought back some of that magic, but it wasn’t a consistent enough ride to warrant a full five stars.